The destruction wrought on the world's oceans by industrial fishing is made clear in a shocking new report. The analysis, published in the scientific journal Nature, suggests 90% of large predator fish have been cleared from the seas in the past 50 years or so. 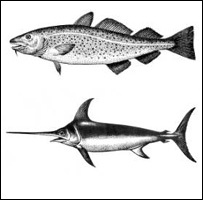 The authors say the era of "heroic" fish - the truly huge swordfish, marlin and sharks that inspired legends and novels - is now well and truly over. And other commercially important species, such as tuna, cod, halibut, skate and flounder are now generally far smaller in size compared with their ancestors. The study has been written by Dr Ransom Myers and Dr Boris Worm of Dalhousie University in Halifax, Nova Scotia. The Canadian marine ecologists, who took 10 years to compile their report, say only dramatic cuts in catches, subsidies and the establishment of a network of "fish parks" will save species from oblivion. They say fisheries managers have tended to consider only recent data on specific species in particular fishing grounds when deciding how to conserve stocks. Such narrow thinking is likely to have lulled these managers into thinking over-fishing was a short-term and local problem, the researchers say. In reality, Myers and Worm argue, only global data taken from many decades show the true scale of the damage done to marine resources by large factory ships. "Our analysis suggests that the global ocean has lost more than 90% of large predatory fishes," they write in Nature. "Although it is now widely accepted that single populations can be fished to low levels, this is the first analysis to show general, pronounced declines of entire communities across widely varying ecosystems." To compile their study, Myers and Worm assembled data sets representing all major fisheries in the world and then constructed trajectories showing the declines of large predatory fish communities from four continental shelves and nine oceanic systems. Their information included some of the first scientific surveys undertaken when large-scale trawling began, and meticulous data collected by the Japanese as they expanded their longline fishing programme. Industrial techniques took as little as a decade or 15 years to reduce fish populations to 10% of their previous number, the authors say. 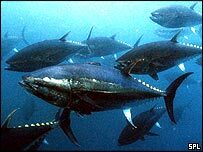 Dr Myers told BBC News Online: "For example, there were 200,000 large bluefin tuna removed from off the coast of Brazil in the first 15 years of the Japanese longline fishery and in the last 15 years off Brazil, with similar effort, the Japanese fishery has caught exactly zero fish. "We have eliminated these very valuable species from very large parts of the world's oceans." He says the average size of top predators today is only one-fifth to one-half of what it used to be. 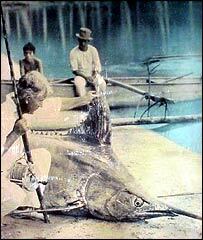 "The few blue marlin today reach one-fifth of the weight they once had. In many cases, the fish caught today are under such intense fishing pressure, they never even have the chance to reproduce... we have to understand how close to extinction some of these populations really are." The authors say the worst-hit species need "a minimum reduction" of 50% in mortality in order to have a chance of recovery. "We are in massive denial and continue to bicker over the last shrinking numbers of survivors, employing satellites and sensors to catch the last fish left," Dr Myers told the BBC. "The last sharks are declining at a great pace and unless we reduce the number of hooks in the water by 50-60% the large sharks will go extinct - we will have no more hammerheads, no more great whites, no more large threshers. "These species will go the way of the dinosaurs unless we take worldwide action to preserve the diversity in the marine ecosystem." Commenting on the study, Professor Callum Roberts, a marine conservation biologist at York University, UK, says the work underlines how people have become accustomed to the current, depleted state of the oceans. "People have forgotten how much fish used to be in the sea," he told BBC News Online. "We've now got 10% of the animals left from the pristine state. This study offers a new perspective for management. We need to revise our targets for stocks upwards which will provide higher productivity over the longterm. "And the only way we are going to achieve this is by creating largescale networks of areas that are entirely off-limits to fishing."